Are we fighting a just war? I’m just asking. President Obama’s speech on Tuesday, which laid out his plans for Afghanistan, Pakistan and al Qaeda, left me feeling conflicted, uncertain, even a little queasy. Apparently I’m not alone. There’s only marginal agreement among Americans about the military buildup, with 51 percent supporting Obama’s plan, according to a USA Today-Gallup survey taken the day after his speech. But almost all of us are fretful. By an almost three-to-one margin (73 percent to 26 percent), Americans said they are worried that the costs of the war will make it more difficult to deal with problems close to home. That is besides the normal anxiety that comes with any major conflict. “Just” is a significant word when talking about war, hearkening to a way of thinking that dates back to the Romans and found its most enduring expression through Christianity. When we talk about a “just war,” we’re talking ethics and theology. There’s irony here, since Jesus told his followers to pray for their enemies and “turn the other cheek” when insulted. For the first three centuries after he walked the earth, most Christian teachers steered followers away from military service. But this pacifist position softened as the Christian faith gained respectability in the Roman Empire, especially after it was legalized in the early 300s and made the official state religion in 380. The question was how Jesus’ instructions to his followers applied in a wider society. Christ taught peace, the reasoning goes, but people and nations – sinners all – must still deal with the world as it is. Part of that challenge is to determine what conditions must be met for a war to be justifiable, even while recognizing that war is a result of sin. Augustine, a North African bishop and considered one of the church’s greatest teachers, framed a “just war” doctrine through his writings in the fourth and fifth centuries, as the collapsing Roman Empire was coming under siege from northern European “barbarians.” His teaching has formed the basis for most Christian thinking about war ever since. 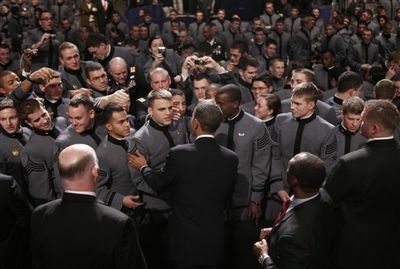 President Barack Obama greets cadets after speaking about the war in Afghanistan at West Point on Dec. 1. Those who govern, “those who have responsibility for the common good,” are burdened with evaluating “these conditions for moral legitimacy,” the catechism says. In other words, war must be declared by legitimate authorities. This being theology, of course, the answers aren’t as simple as this list suggests. Libraries are full of books that tease out various interpretations. So does the war against al Qaeda via Afghanistan qualify as a just war? I’m no theologian and even less of a military expert, but a few answers seem clear. When we beyond these few certainties, however, the answers grow murky. For now, maybe it’s enough to make sure we ask ourselves questions like these – ethical and theological questions – if only to remind ourselves of what is at stake, even more than economics, politics or national security. As we should know by now and as Augustine and other theologians knew a long time ago, we don’t risk only the lives of soldiers when we go to war. We risk our souls. First published in the Johnson City (Tenn.) Press, 5 Dec 2009.